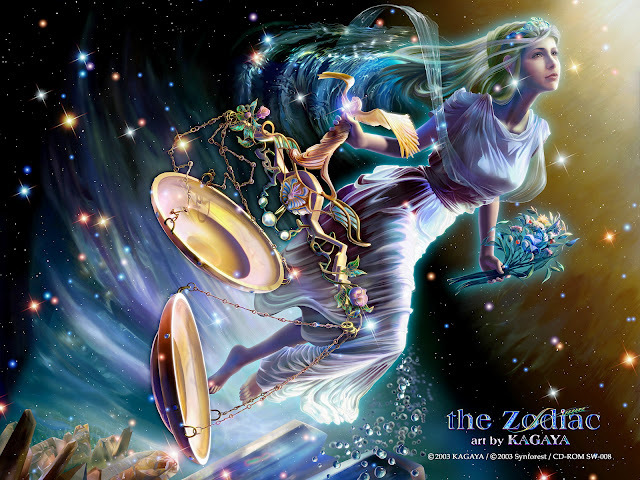 The scales are the key to understanding Libra, who is constantly weighing the possibilities and the choice at hand. Often crippled by indecision, in desperation the Libra will resort to making a choice, any choice, even thought it may not be the best option. Ideally Libra’s function is to resolve opposing possibilities by seeking a third way. Ruled by Venus, Libra likes things that are aesthetically pleasing, charming and artistic. Libras tend to hide personal flaws they imagine might offend. They are diplomats and like peaceful harmonious surroundings. Moon in Libra: This is the best time to work magick involving artistic work, justice, court cases, partnerships and unions, mental stimulation and karmic spiritual or emotional balance. Healing rituals for ailments of the lower back or kidneys are also done during this period of time.